Erica Bunker | DIY Style! 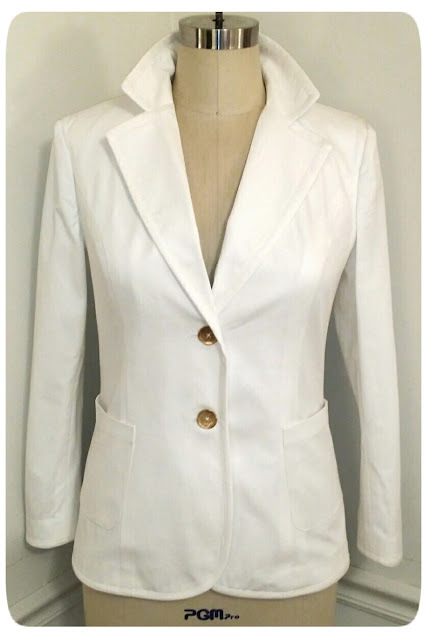 The Art of Cultivating a Stylish Wardrobe: Review: Simplicity 1421 | A White Blazer for Summer! Review: Simplicity 1421 | A White Blazer for Summer! I've been needing a new white blazer in my wardrobe for a while now. I'd made Simplicity 2250 three years ago, and I nearly wore it to shreds. A white blazer is a much needed necessity in my closet. This time I wanted something a lot crisper and much more tailored than its predecessor. That Black Chic brought Simplicity 1421 to my attention when she announced a sew-a-long. This pattern has been on my list since it first came out. I had the larger size in my stash, but since this is a fitted style blazer, I ended up having to repurchase the smaller size range. Let's talk construction! This is an unlined jacket with cup sizes. Sounds easy enough, right? Not necessarily... My fabric is a bottom weight stretch cotton twill from Joann's. I cut the size 14, instead of a 12 with a C cup, because I'd read reviews where others said that the jacket was really fitted. And even though the jacket is white, the weight of the fabric allows for it to be worn throughout the year with our mild climate. I needed to make sure that it wouldn't be too snug to layer over a long sleeve shirt or a lightweight sweater. The alterations I made to the pattern was adding an inch at the waist, and an inch to the sleeve length. I've made a LOT of tailored jackets and coats throughout my sewing career, so I never use commercial pattern instructions... I have my own methods and loads of other resources I pull from. I did however glance at the instructions for the seam binding to see if the pattern was draft already or if the seam allowance would need to be trimmed. It was drafted correctly. For the front pieces and the front facings, I blocked fused them and then cut them out. All of the front and back pieces went together perfectly. 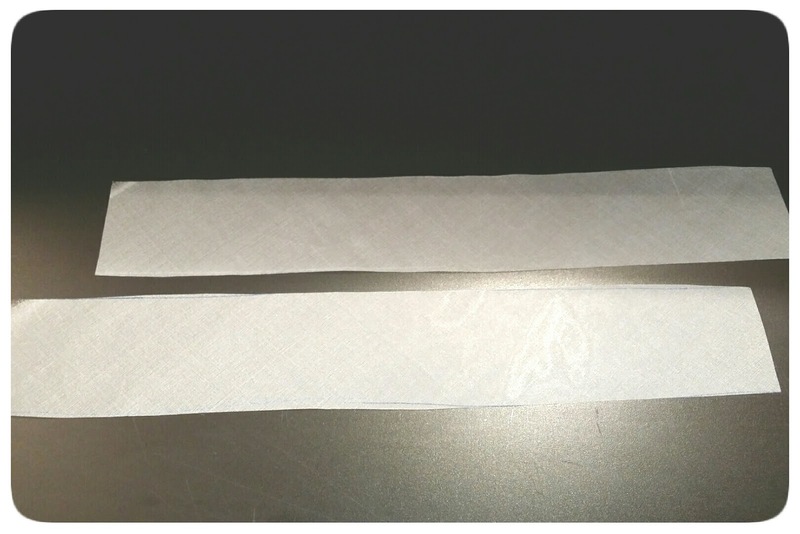 You would think an unlined jacket would have a less complicated construction than a lined one. Well, I guess that's a matter of opinion based on the type of seam finishing you choose. I used a bound seam finish. 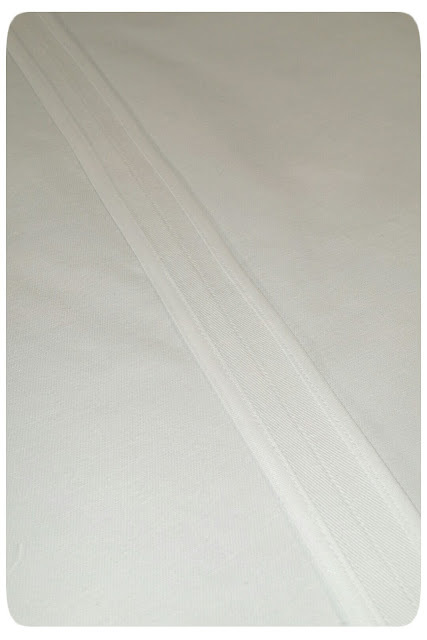 A bound seam finish is when the binding is wrapped around each raw edge and sewn in place with one line of stitching, as opposed to two stitchings with a Hong Kong finish. Quicker, but still a tedious process. 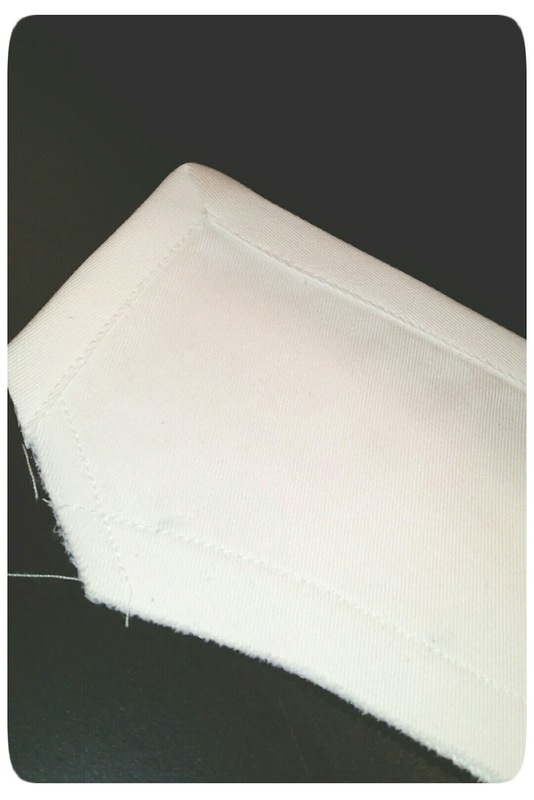 And I used pre-packaged double fold seam binding. Next is the collar. 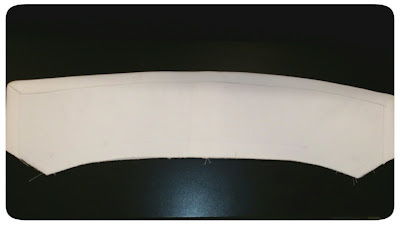 The collar is drafted like any tailored collar, with an upper collar, cut in one piece and the under collar cut in two pieces on the bias. Since the collar has a bound seam finish, there is to need for "turn of cloth". The seam binding is cut from the same fabric as the jacket fabric and took a little maneuvering to get good finish on the corners. 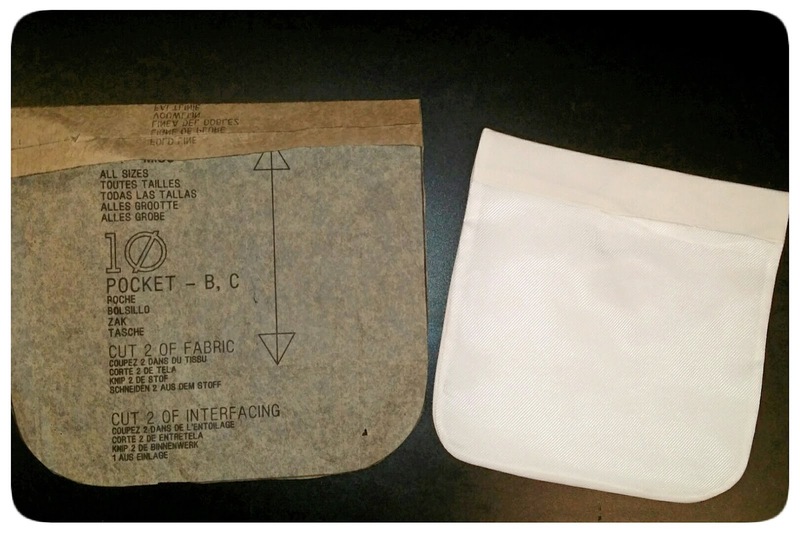 The pattern suggested the patch pockets be unlined but interfaced. Well, I wanted lined pockets, so I drafted a lining from the pattern piece. Here is the lined pocket. and edge stitched on to the jacket. The facings are sewn, the jacket is hemmed and the seam binding is applied to the jacket. And I went ahead and made my buttonholes and sewed on my buttons. 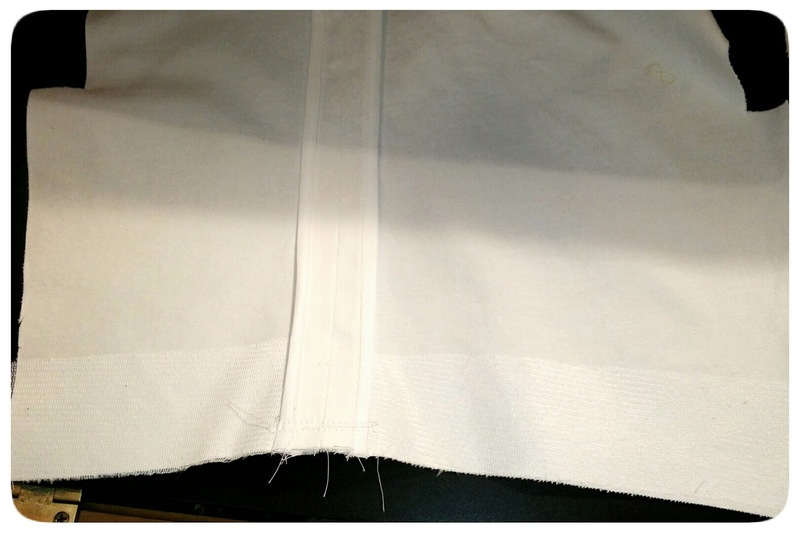 My sleeves are also finished with bound seams. And I always, always interface the hems of jackets! This pattern has a RTW style sleeve vent. And here's the mitered corner. 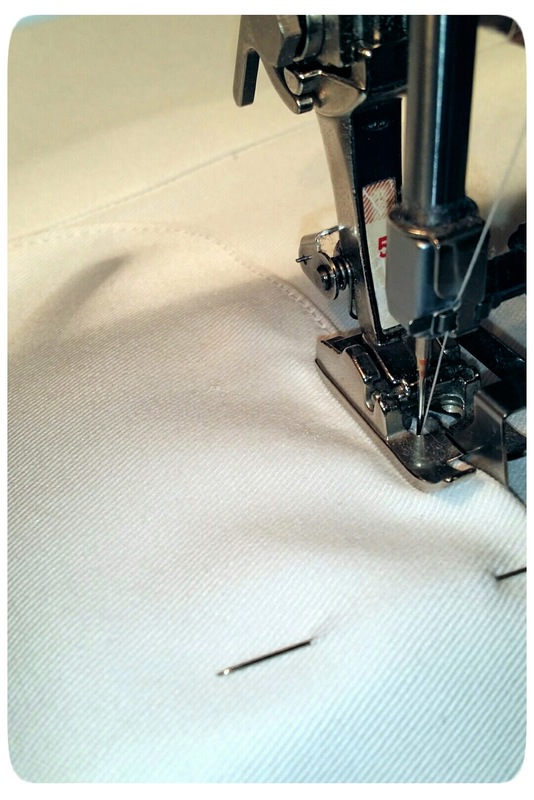 The hem is stitched by hand. 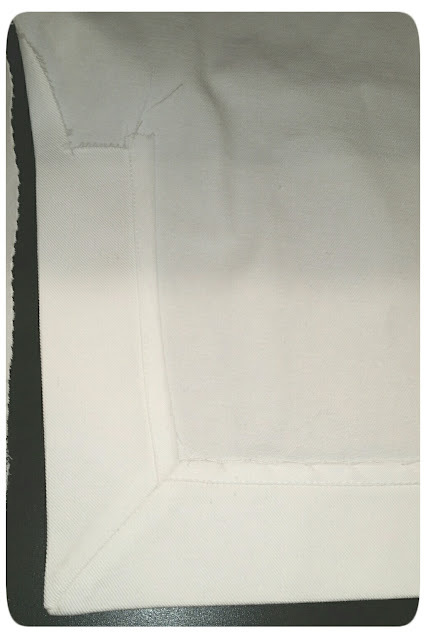 I had read where some felt that the sleeves were difficult to set. Well, I came prepared to do battle with my fool-proof TNT method. Since my jacket is unlined and I opted against shoulder pads, hair canvas is too itchy to use for this jacket. 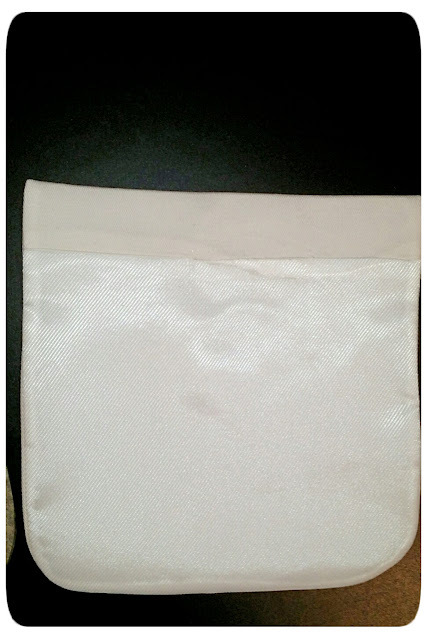 I used two 2" x 12" bias strips of silk organza. Not polyester organza, but silk organza. And set my sleeves with hella pins! Side note: Am I the only one who struggles with finding matching buttons in multiple sizes? It's always an adventure and Mikaela is usually with me, making fun of me and not understanding why it's so hard to find buttons. But I lucked up and found these. I really wanted gold buttons. I love how they look on white jackets. Great styling, appreciate the construction details you've put into this post. 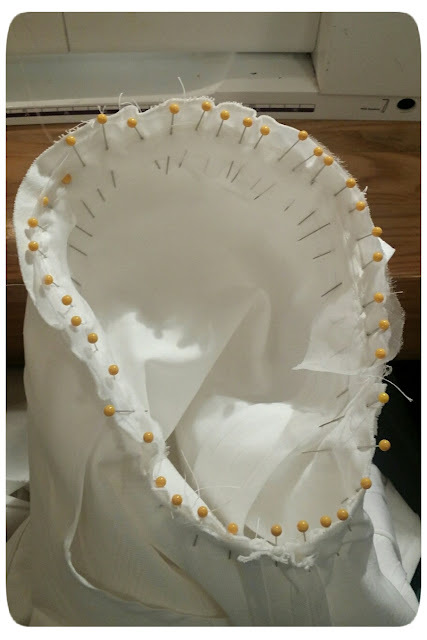 It's so interesting to me to see the insides of garments and the process. Hard work pays off in many ways, the time you've put into your sewing shows in your garments and the time in the gym shows in your great figure. The jacket is awesome! I still struggle with sewing jackets and I learned some great tips from this post. Thanks for the in process photos and explanations. Another amazing creation for you, Erica! You really persevere and produce! Killer Shoes!!! Very nice jacket. I love the shorts you're wearing. Do you have a pattern for them. Thanks Sweet Waters! That post is coming up. Gorgeous jacket, thank you for all of the sewing details. You look fabulous in it, of course! I love this! I love your collar treatment. Lov'n these long jackets. After just making one for a friend, I've decided I need to make me more. The pattern I used is very similar, but a McCall's. I'll do a post about it this week. 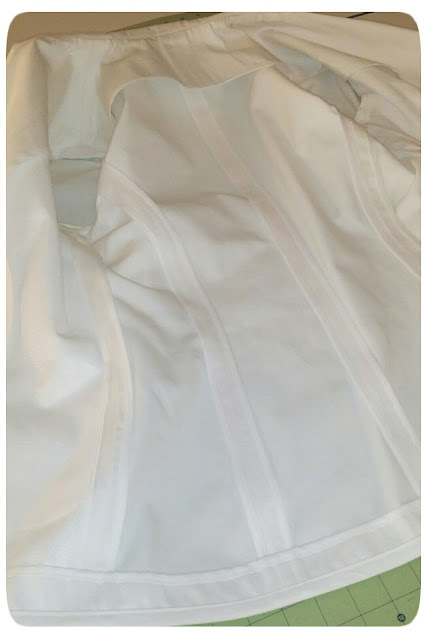 Like you, even though it's unlined, I still like for my jackets to have that finished professional look on the inside. I did partial hong-kong finishes, but wish I had gone the distance. Beautiful work as always Erica!! Another project done too perfection! Beautiful sewing, beautiful jacket and beautiful outfit! Thanks for all the tips. Great jacket! I love it when you post detail shots; thank you so much for sharing. I've made a few jackets and I even worked as technical designer for many years for a better suits company, but I still find sewing them to be rather intimidating. I think it's because of the many steps involved. 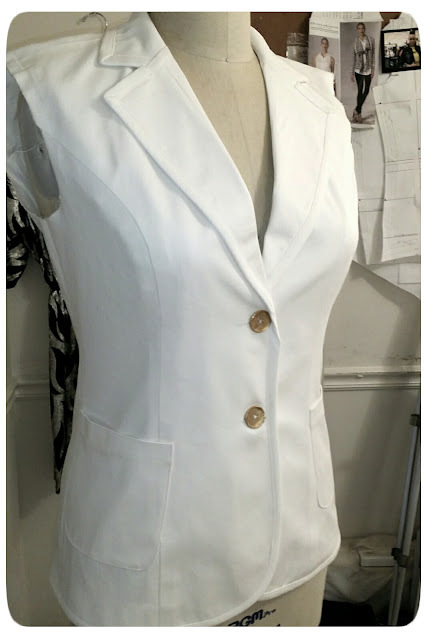 Anyway, I have this pattern in my stash and I've been noticing that I need a new unlined linen jacket so maybe it's time to give this pattern a go. Gorgeous jacket, I love the classic white. I struggle to find enough buttons in one size at Joann's. There is usually only 2 cards per size. Buttons always give me a mild headache! Thanks Lori! Totally on board with the button struggle. I try to remember to go to Goodwill or salvation army to find buttons to cut off. 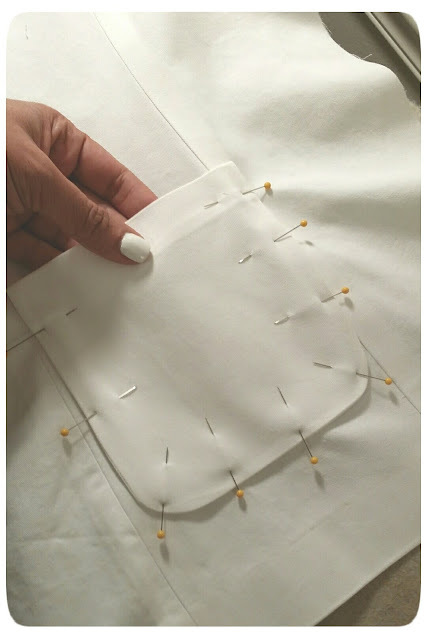 thanks for sharing your sewing! It takes time to take photos & do all that computer stuff. Thanks Michelle for bring this great jacket to my attention! Looks great. A definite basic for any closet. You make it look so casual, not all stuffy. With great styling, you can dress up or dress down anything. Thanks Andrea! 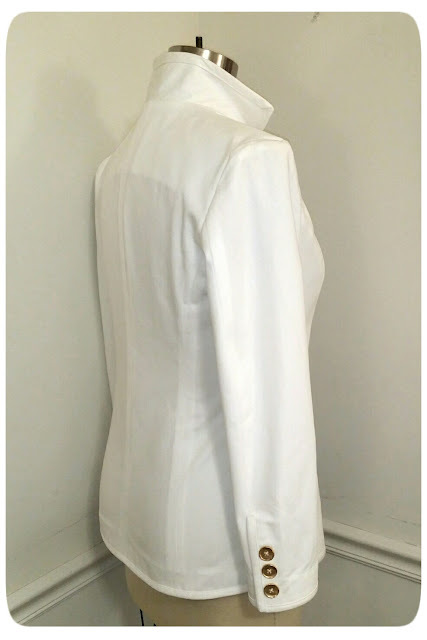 Nothing like a crisp white summer jacket. Very nice. Love Love Love! I cant wait to get to the level of (basic jacket making) I started one last year got to the collar and well there it sits.. I will work up the courage to tackle it one day. Yours however, is beautiful! Nothing like that feeling you get when you know you've created a work of art! I can see the time and money that went into its construction! Thanks for all of the construction techniques. I had to Pinterest a few to see how to do them. So I learned some new techniques. Love this post too! Can't wait for the sew-a-long. Welcome to Erica Bunker . . . DIY huh . I have been following you for a min, it's 2017 and you are living it! Your floetry is on 10 and I love it! Ok, ok I see ya! 😀😂 I have learn so much from you, my moma's from LaFayette, I from you, and about you . . . I see ya! Patiently waiting on Erica Bunker DIY Sew Mag!